Jan Gabriel, the Chicago-area motorsport announcer who popularized the phrase "Sunday, Sunday, Sunday! ", died last week at 69. He got his start as a sock-hop disc jockey and eventually moved into automotive television. Fittingly, he passed on a Sunday. Gabriel was a Wisconsin native, but he spent most of his life in the Chicago area. 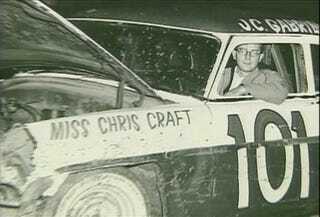 He rose to fame as the announcer for Illinois's Santa Fe Speedway, and his voice was often heard on commercials promoting Chicago's "Smoking U.S. 30" drag strip. Because the track's owner owned several other speed venues around the country, many of which Gabriel recorded advertisements for, his deep voice and trademark "Sunday, Sunday, Sunday!" call became widely known. From 1992 to 1994, Gabriel hosted the television show "Super Chargers," a quirky look at motorsport, automotive culture, and celebrity car enthusiasts. He's also credited with helping get TV coverage of NASCAR racing, monster trucks, and the NHRA off the ground. Gabriel's memorial service is this — you guessed it — Sunday in Chicago. Rest in peace, Jan — we grew up listening to and watching you, and you'll definitely be missed.